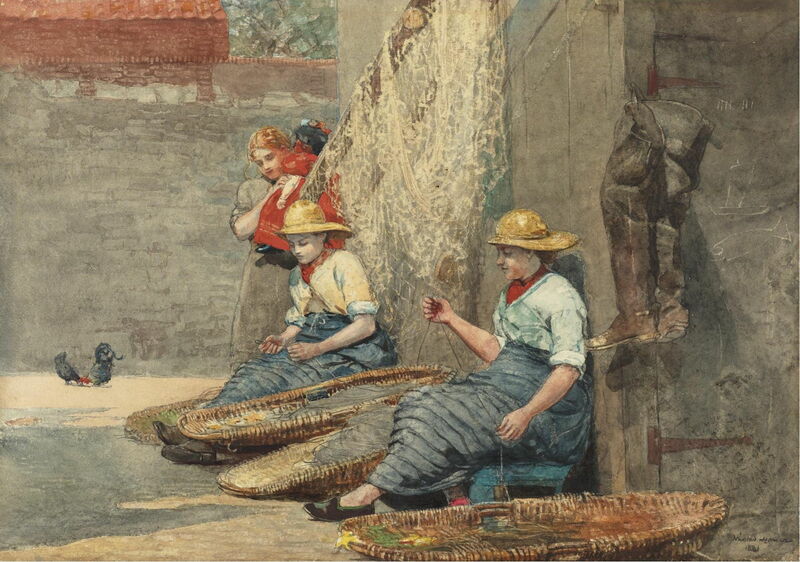 Winslow Homer (1836–1910), Four Fishwives (1881), watercolor on paper, 45.72 × 71.1 cm, Ruth Chandler Williamson Gallery, Scripps College, Claremont, CA. Wikimedia Commons. 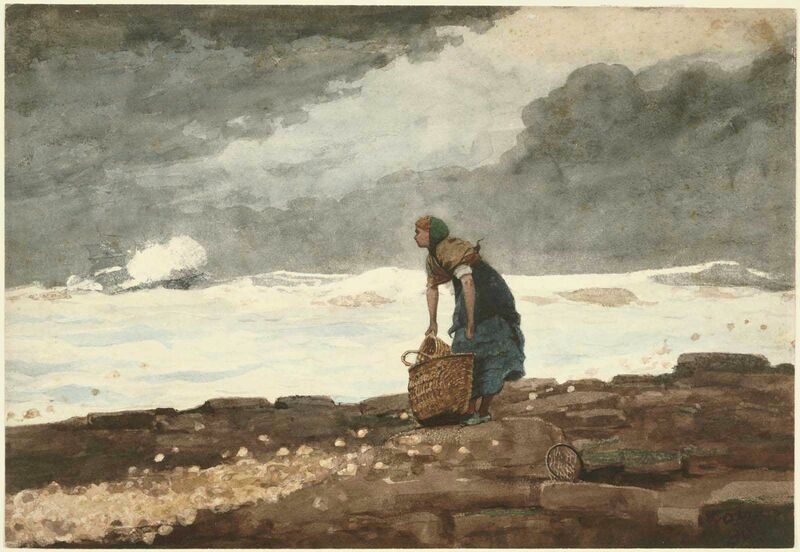 This article rounds off my series looking at Winslow Homer’s paintings from Cullercoats, by setting them into a narrative context. Many individual paintings have their own, small narratives. What I want to do here is, using some of the best of his work from 1881-2, to see how they assemble into a larger narrative about the life of fishlasses, fishwives, and the fishermen of Cullercoats. Like many fishing communities at that time, everything in the lives of individuals and the community as a whole was driven by the cycle of fishing activity. This cycle starts with the departure of the men and boys on board their boats, to go in search of a catch – an event which Homer does not seem to have painted. With their menfolk away at sea, the women and girls returned to their maintenance tasks, of making and mending clothing, nets, and other fishing gear, and of caring for the other members of their families, who were too young or too old to go to sea. Winslow Homer (1836–1910), A Fishergirl Baiting Lines (1881), watercolor, 31.8 × 48.3 cm, Yale University Art Gallery, New Haven, CT. Wikimedia Commons. Lighter work, such as preparing lines and tackle, was usually performed by the younger women. When the weather was fine they would sit outside in their yards putting bait onto lines, then coiling the lines carefully into the shallow wickerwork baskets from which they would be deployed. 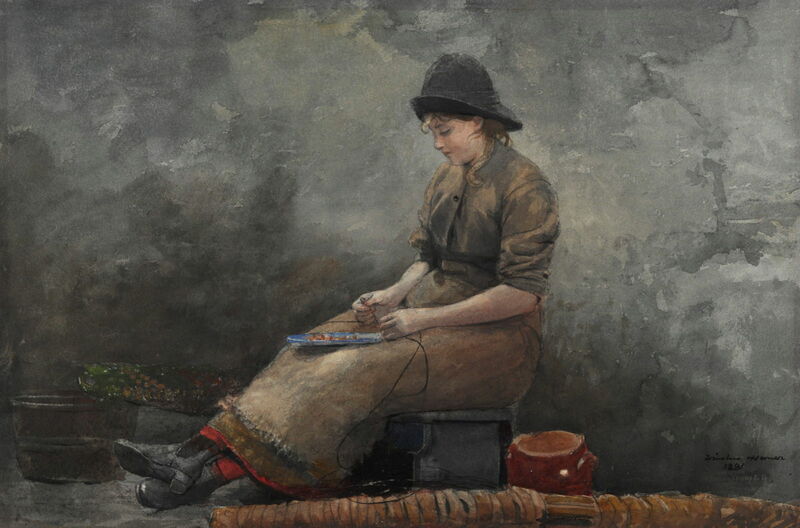 Winslow Homer (1836–1910), Fishergirls Coiling Tackle (Fisherman’s Daughters) (1881), watercolor on paper, 35.6 × 50.2 cm, Private collection. Wikimedia Commons. Once the fishwives thought that the boats might return, they would post lookouts to scan the horizon for them. In fine weather they would take the whole family up on top of the low cliffs, and one would stand and act as lookout. 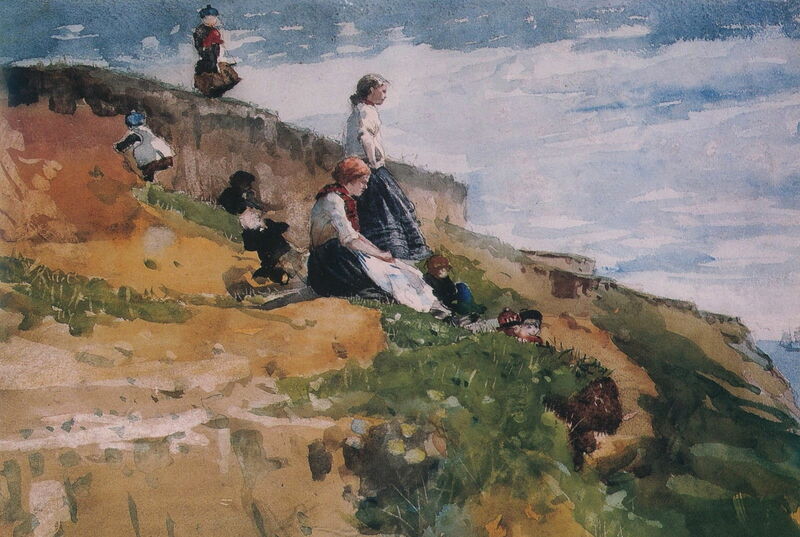 Winslow Homer (1836–1910), On the Cliff (c 1881), watercolor, dimensions not known, Arkell Museum, Canajoharie, New York, NY. Wikimedia Commons. As they went about their work, wherever they were, they would look out to sea, watching for the boats to come in. 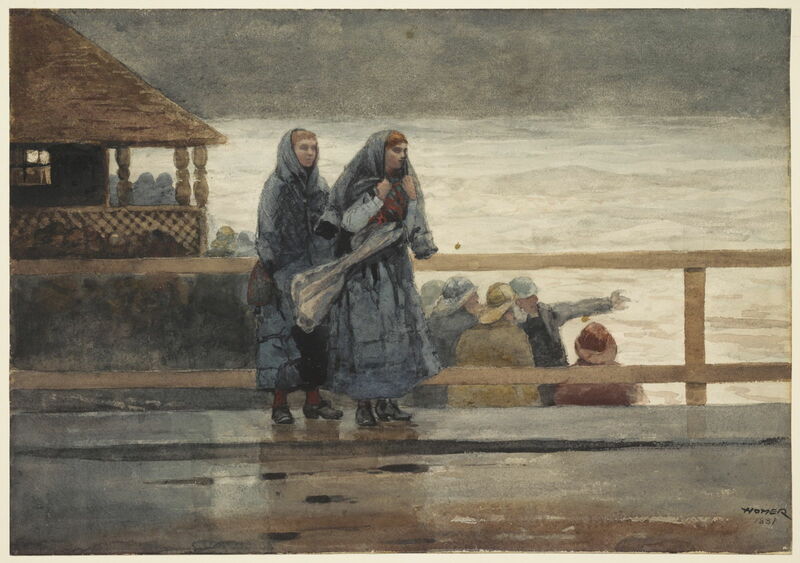 Winslow Homer (1836–1910), A Fresh Breeze (c 1881), transparent and opaque watercolor over graphite pencil on paper, 35.6 × 50.8 cm, Museum of Fine Arts, Boston, MA. Wikimedia Commons. Whenever they had a moment, they would watch, waiting for the next stage in the cycle to begin. 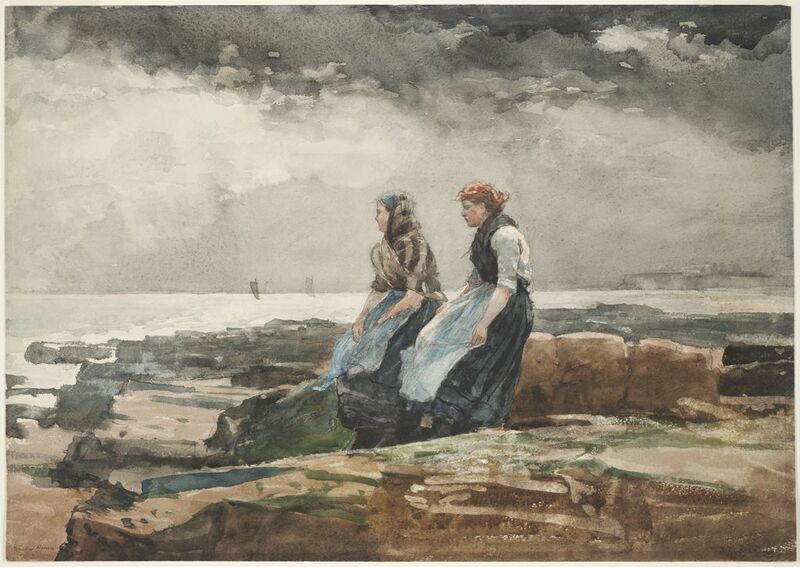 Winslow Homer (1836–1910), Looking Out to Sea (c 1881), watercolor over graphite on wove paper, 34.7 × 49.2 cm, Fogg Museum, Cambridge, MA. Wikimedia Commons. When the weather was bad – in gales, rough seas, or fog – the watching became more tense. They knew that the risks to their menfolk were greater, and that the chances of losing a man overboard, injury, and death were increased. 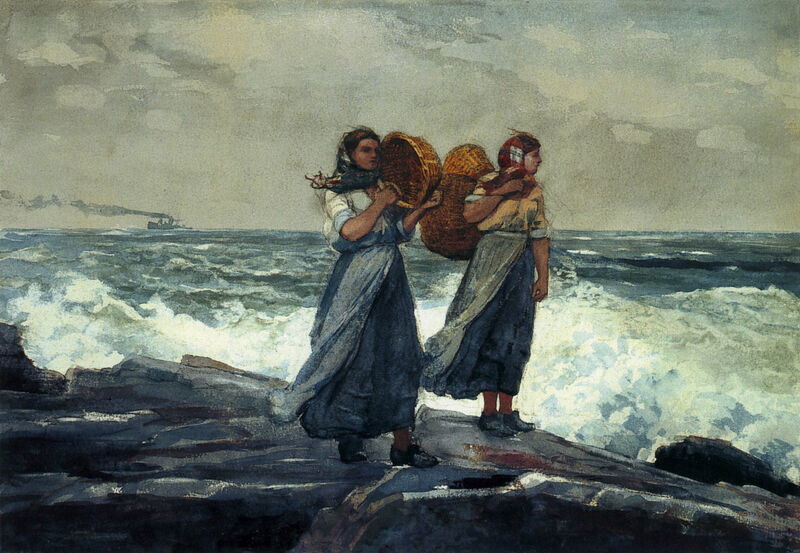 Winslow Homer (1836–1910), Perils of the Sea (1881), watercolor over graphite on cream-colored wove paper, 37.1 × 53.2 cm, Clark Art Institute, Williamstown, Massachusetts. Wikimedia Commons. They knew the violence of the sea, how it could drive large well-found vessels ashore. They feared the winter storms, with easterly gales which could bring shipwreck and disaster. The worse the weather, the more they watched, and the more anxious their watching. Winslow Homer (1836–1910), Girl with Red Stockings (1882), watercolor over graphite pencil on paper, 34.2 × 49.5 cm, Museum of Fine Arts, Boston, MA. Wikimedia Commons. 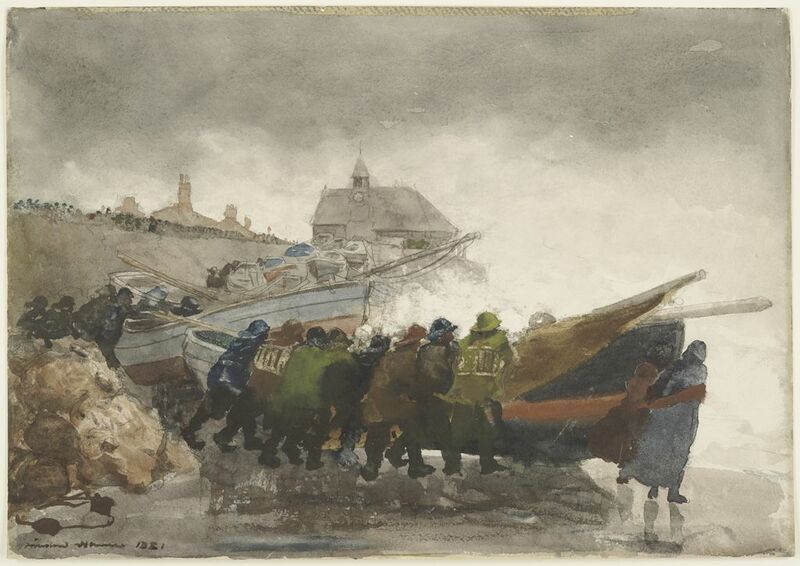 Even when all the Cullercoats boats were safely stowed in harbour, they knew that their menfolk might have to take to the sea in the lifeboat, rowing out to rescue others in distress. They remembered the lifeboat which was lost with all hands, and watched, fearing for their men, and the risks that they took for others. Winslow Homer (1836–1910), Watching the Tempest (1881), watercolor over graphite on wove paper, 35.6 × 50.4 cm, Fogg Museum, Cambridge, MA. Wikimedia Commons. Once they could see the boats returning, they flocked down to receive them. As the first arrived they looked intently to see their own, poised ready with the fishbaskets, for when their boat comes in. 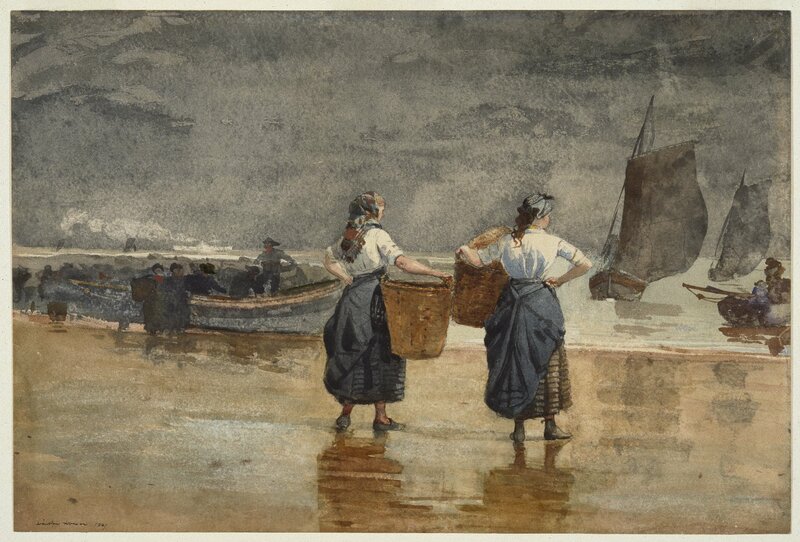 Winslow Homer (1836–1910), Fisher Girls on the Beach, Cullercoats (1881), watercolor, 33.4 × 49.3 cm, Brooklyn Museum, New York, NY. Wikimedia Commons. The whole family went down to greet the boats, transfer the fish to their baskets, and haul the catch back up to the village. There they prepared the fish for despatch to the fishmarket in North Shields, hoping to get good prices so that they could feed and clothe their families. Again, he does not appear to have painted the women processing the fish, nor the catch being despatched for sale. Their menfolk brought the fishing gear back up, for the women to prepare once again for the start of the next cycle, when those men returned to sea to fish. 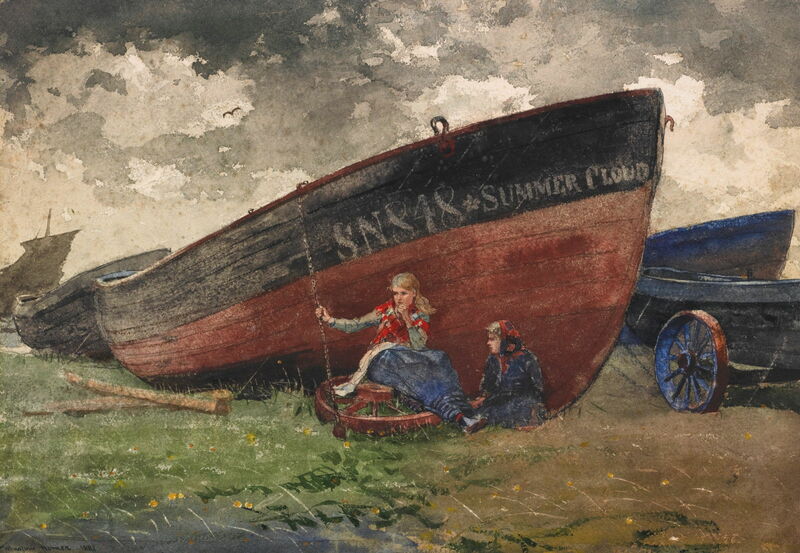 Winslow Homer (1836–1910), The “Summer Cloud” (1881), watercolor on paper, 34.3 × 50.2 cm, Private collection. Wikimedia Commons. There were sometimes a few moments when they could sit up by the boats which were out of service, taking up some of the sunny spells. But always, through force of habit, they remained watching. 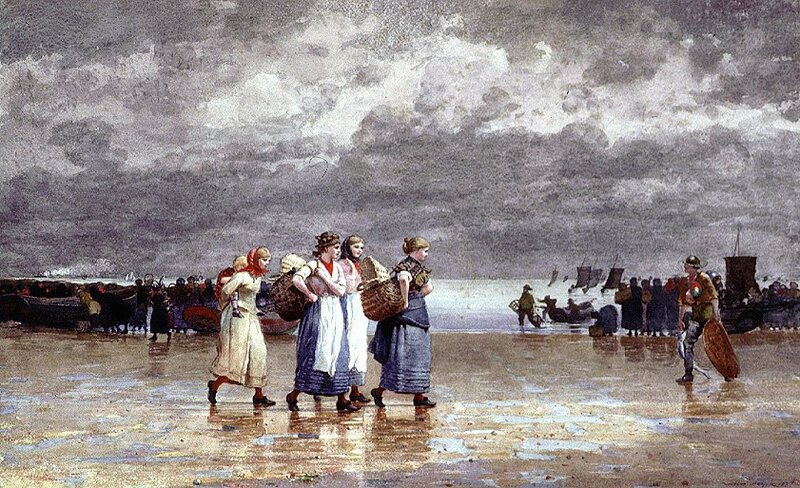 So, in eleven of Winslow Homer’s best watercolour paintings from his 19 months spent in and around Cullercoats, he has provided us with the very human and personal story of the fishlasses, fishwives, and fishermen of the community of Cullercoats, on the north-east coast of England, in the late 1800s. Cikovsky, Jr, N, Kelly F et al. (1995) Winslow Homer, Yale UP. ISBN 978 0 3000 6555 8. Griffin RC (2006) Winslow Homer, An American Vision, Phaidon Press. ISBN 978 0 7148 3992 9. Tedeschi M and others (2008) Watercolors by Winslow Homer. The Color of Light, Yale UP. ISBN 978 0 300 11945 9. Posted in General, Painting and tagged Cullercoats, Homer, narrative, painting, Turner, watercolour. Bookmark the permalink. What a wonderful experience! I am an avid admirer of Wimslow Homer, his choice of subjects, his amazing ability to draw and use watercolours so effectively. I visit Cullercoats and paint in watercoulor so I really appreciate his supreme skill taking the scene in front of him and laying it out on paper and adding colour washes. He relied upon his artistic skills, no digital camera for him.